The Hawkeye 50K, held in early spring along the shore of Lake MacBride (near Solon), is one of Iowa’s oldest and most scenic ultras. 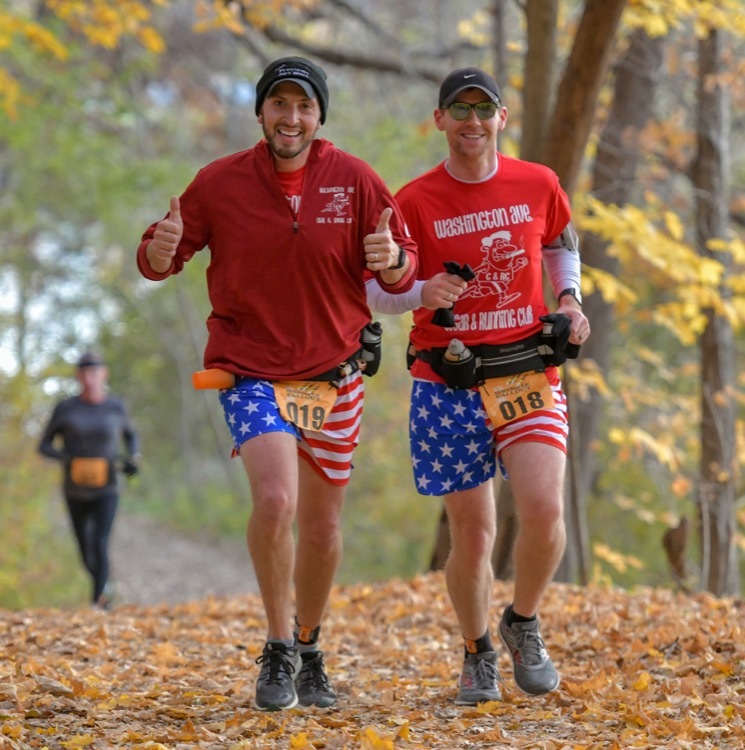 After sampling runner feedback from the 2018 race, RD Brian Tharp, owner of We Run, a specialty running store in North Liberty, Iowa, decided to reprise the race in the autumn. To make the fall event unique, Brian planned to reverse the course, sending runners on a clockwise circumnavigation of Lake MacBride instead of the traditional counterclockwise route. 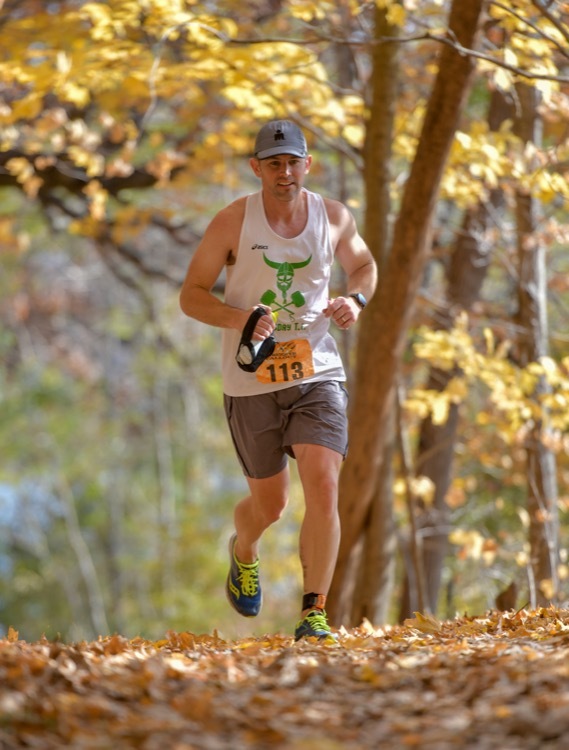 Brian chose a late October date to take advantage of the fall colors and christened the new race the Hawkeye Fallout 50K. Everything else about the race remained the same: a mixed track of crushed gravel, rolling single track and road. Same iconic water crossing. Same 2,300’ of elevation gain. Same enthusiastic volunteers, serious bling, and old-fashioned potluck post-race celebration. Same race charities: Team RWB and Team Rubicon. What Brian didn’t plan for were biblical rains in October, a typically dry month in Iowa. So much rain that area rivers, lakes, and streams spilled out of their banks, including the Mighty Mississippi, which never floods in the fall. The spillway that allows runoff from Lake MacBride to flow into the adjacent Coralville Reservoir is part of the course but is usually more of a nuisance than a serious hazard. But, in the weeks before the race, the water climbed so high that the crossing required a boat. Or, an ark. Brian plotted a workaround that would keep runners safe, use as much of the original course as possible, and keep the distance as close to 50k as practical. The solution was relatively elegant. Since the race originally included two 25k loops around Lake MacBride with the spillway about midpoint, Brian decided to do two out-and-back sections: first, clockwise from the start to the spillway and back. Then, counterclockwise from the start to the spillway and back. It wasn’t perfect. The spillway water crossing is the race’s most dramatic feature – and a runner favorite – but safe is always better than sorry. By race morning, Mother Nature was sporting another, more benign, face. Gone was the rain, replaced by early-morning clouds and brilliant late-morning sun. Because of the last-minute re-routing, the course was about a mile too long, which likely impacted finishing times a bit, but racing conditions were excellent. The track was generally dry and runnable; temps hovered in a runner-friendly range from the low 40s to the high 50s and winds were light. The spillway was still underwater, but even that couldn’t dampen the enthusiasm. Tanner Clark topped the field in 4:22:40 in a course record that, given the ad hoc course design, will likely stand for a while. Perhaps forever. Bethany Cochran claimed her piece of Hawkeye Fallout immortality with a time of 5:02:40 to top the women and land her sixth overall. All in all, it was an auspicious start for the Hawkeye Fallout 50K debut. Including the 25k option, run on the back half of the 50k course, 155 runners signed up for the race. 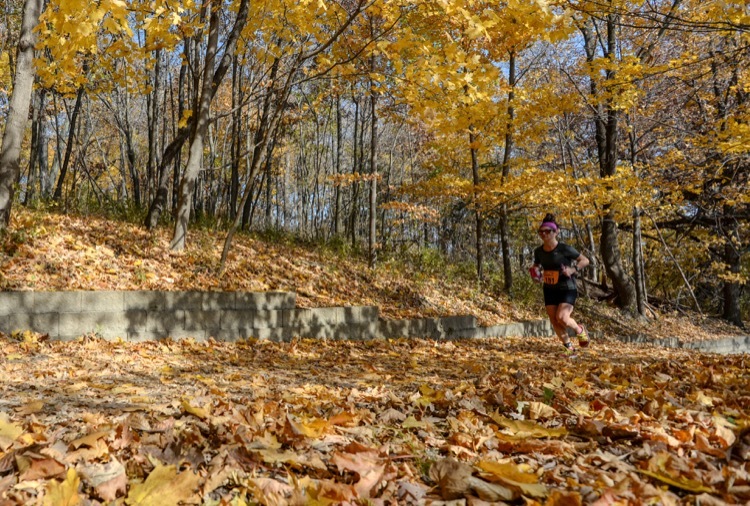 With a scenic course enhanced by fall colors and a well-run race (with stylish shirts, dramatic finisher’s medals, and video finishes of every runner), the Hawkeye Fallout 50K should join its elder sibling, the Hawkeye 50K, as a must-do ultra for Midwesterners. Perfect write up on this amazing event. Thanks for sharing it with the ultra community.